24 hours. 17 Pat’s Pizza locations. 2 determined Maine men. 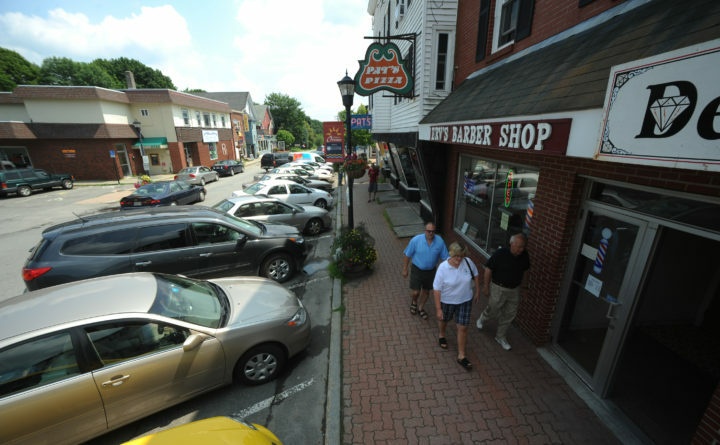 People walk own Mill Street in downtown Orono. Going to college at the University of Maine in Orono, Matt Clark and Matt Grondin bonded over their shared love of things like hip-hop, baseball and pizza. Pat’s Pizza, to be specific, the iconic Maine pizza chain that was founded in Orono in 1931. 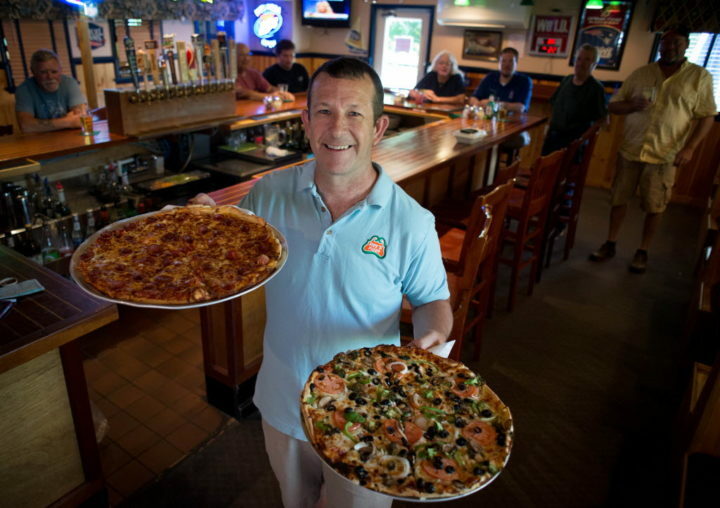 Although they now live on opposite ends of the state — Clark in Bangor and Grondin in Cumberland — there are 17 Pat’s Pizza locations between Portland and Presque Isle, so they can sate their craving for a pie any time they want. Having a Pat’s near home is just not enough for Clark and Grondin, however. They want to go bigger. They want to prove their love for Pat’s Pizza in a truly epic way — by visiting all 17 locations in 24 hours. This Friday night, Oct. 19, they will start their quest, something that, as far as they know, no one else in Maine has yet accomplished. “And we get to eat a [lot] of pizza,” said Grondin, a Bangor native who graduated from Bangor High School in 1997. The journey begins Friday evening in Presque Isle, where the pair will visit the Pat’s there just before it closes at 10:30 p.m. They’ll then spend the night in a hotel in town, and get up early on Saturday to drive to Machias, to visit the next Pat’s on the stop. 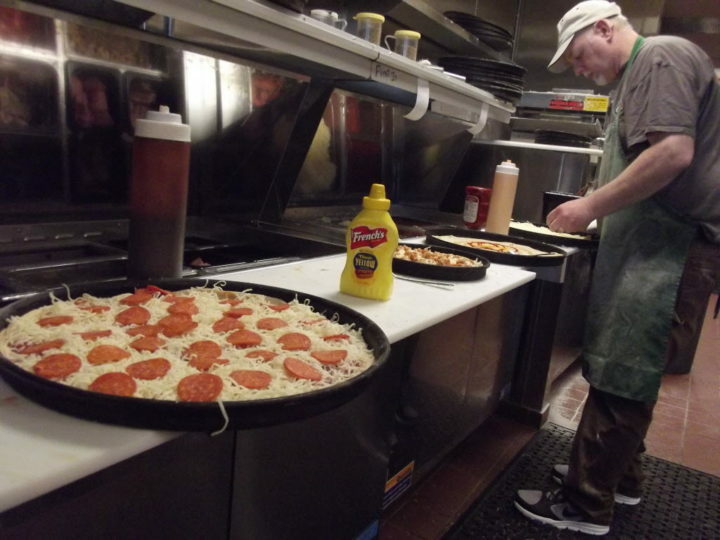 Bill Burke makes pizzas for customers at his Pat's Pizza franchise in Machias. Clark and Grondin admit it would be ill-advised to each eat a slice of pizza at all 17 locations — roughly the equivalent of two large pizzas per person in 24 hours. (Grondin’s usual Pat’s order is mushroom and jalapeno, and Clark’s is double dough, double pepperoni.) But they do plan to at least buy something at each location. From Machias, they will then visit the Pat’s locations in Ellsworth, Bar Harbor, Holden and Hampden, all in relatively speedy fashion. After that, there’s a bit of backtracking, as they head back north and hit Orono, Lincoln, Milo and Dover-Foxcroft. The pair said they wanted to either start or end at the original Pat’s in Orono, but logistically it was impossible to keep the journey under 24 hours and still do so. Tim McCarthy, general manager of Pat’s Pizza in Ellsworth. After Dover-Foxcroft, Clark and Grondin will hit up Augusta, Auburn, Brunswick, Scarborough, Yarmouth and Windham, before closing out the night at the Pat’s Pizza in Portland’s Old Port. The final leg of their journey will be a whirlwind attempt to get to Portland before 11 p.m., to make the 24-hour deadline. “It will definitely be down to the wire, and it may end up being more like 25 hours, which we are OK with if that ends up happening,” Clark said. Clark and Grondin wanted to add a charitable element to their challenge, so from now until they get to their last Pat’s on the tour, they will be taking donations for the Good Shepherd Food Bank via the event’s Facebook page. For Clark and Grondin, who both are parents to Pat’s Pizza-loving kids, the 24-hour Pat’s Pizza challenge is mostly just a fun thing to do. It’s also a chance to relive some treasured college-era memories and mark the fact that life moves on, often at a quicker pace than one might want. Follow Clark and Grondin’s progress on Saturday, Oct. 20, via Facebook.